Directly outside the city walls of old Bruges lies our house and beautiful garden. The house consists of a main house and a house, formerly used as stables, and that the former owners calles “The Doeninghe”. The Doeninghe is actually a farm or farmhouse where things are “done” or where to “do” is. 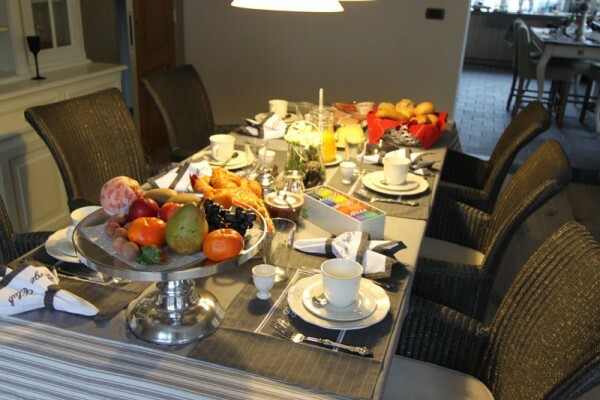 We have taken this typical Bruges term and connected it to our Bed & Breakfast, originally an old farmhouse where many people came and still come and where there’s always something to do. The large rooms, cozy courtyard, the veranda and the terrace on the sunny garden provide a pleasant atmosphere where you imagine sourself to be in the Cotswolds or the Provence on a sunny day. During your stay you can use all these areas and the hostess is always at your service. 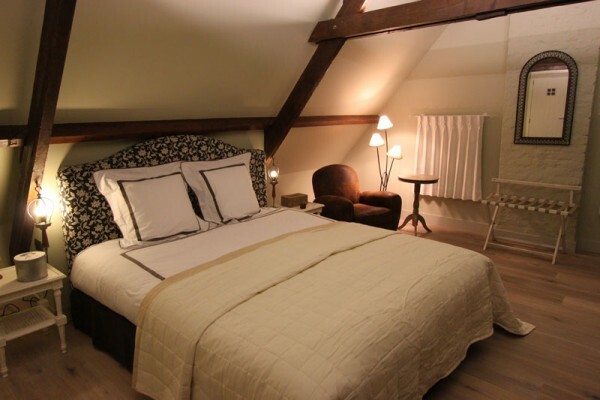 Come relax in our Doeninghe, a former farm-house in Bruges in an English atmosphere. This room is situated on the rear side of the house and is unique with its authentic wooden beams supporting the roof. Romantic room in english style with large double-bed by Sleepy and a cosy reading-corner, separate bathroom with shower with authentic english taps and separate toilet. This room is situated at the front of the house and has a remarkeable high ceiling with beautifull lighting. 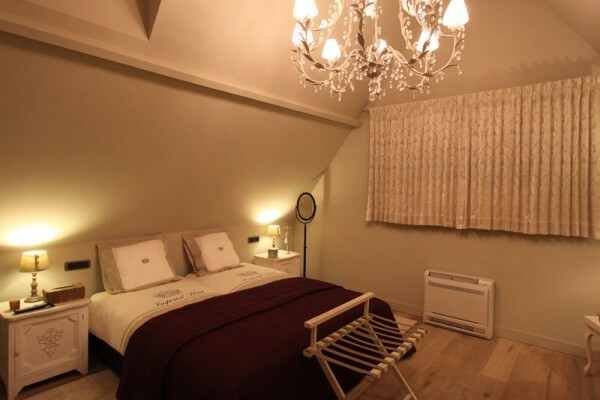 Romantic room in english style with large double-bed by Sleepy and a cosy reading-corner, separate bathroom with shower with authentic english taps and toilet. Breakfast is served in the kitchen, the veranda or the courtyard overlooking our beautiful garden. We provide a full breakfast as closely as possible to your wishes. Daily fresh bread, rolls and / or croissants. Every day there is a changing assortment of cheeses and meats available next to jam and chocolate-paste. Even breakfast cereals with yogurt is on the menu. Do you fancy a hard-boiled, scrambled eggs or sunny-side-up (horse-eye)? We prepare this fresh for you. Fresh coffee be poured with the ‘More’, assorted teas and freshly squeezed orange juice complete the most important meal of the day. Wij hebben hier 3 nachten gelogeerd in de sfeervolle, schone kamer de Beneen. De gastvrouw doet er alles aan om het je naar de zin te maken. Het ontbijt was elke morgen weer een heerlijk en goed begin van de dag. De ligging is ongeveer een kilometer buiten het centrum van Brugge en door onze meegebrachte fietsen prima te bereiken. 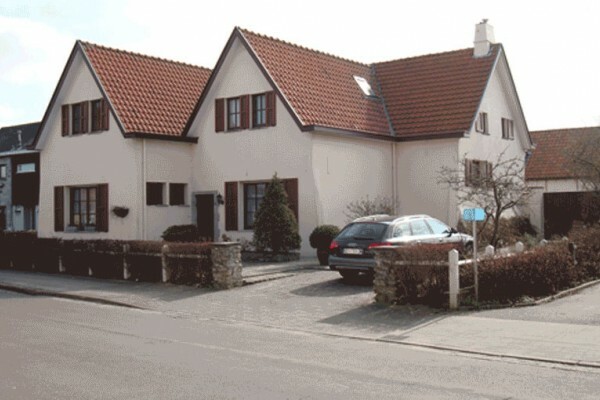 Did you stay in B&B Doeninghe? Let us know what you thought about it and help others to make the right choice! * I confirm having stayed in B&B Doeninghe.